Seven witnesses in the city’s post-Godhra Best Bakery carnage case today left for Mumbai amid tight security to testify before the special court of Justice Abhay Thipsay, who is conducting the re-trial of the case from tomorrow. Lucknow: The blame game has begun. After making a hash of the much-hyped inauguration of the six-month-long International Taj Festival at Agra Fort on September 27, the state government is now trying to wriggle out of the mess by putting the blame at the Centre’s doorstep. Non-resident Indians (NRIs) from Orissa have extended their support to the poverty-stricken family members of Raghu Nayak, who apprehended Nathuram Godse and pinned him down after the killer fired the lethal shot at Mahatma Gandhi in 1948. India and South Korea will sign an extradition treaty and a treaty on mutual legal assistance in criminal matters during the three-day state visit here by South Korean President Roh Moo-Hyun beginning tomorrow. The police fired in the air to disperse the angry mob, which attacked the Mango police station here last night following the death of a 24-year-old detainee. Railway Minister Laloo Prasad Yadav today said persons found littering the railway premises and relieving themselves on the tracks would be penalised. Railway Minister and RJD chief Laloo Prasad has said that he would put before the Supreme Court the facts on the fodder scam probe. After Priyanka Vadra disappointed them in the May Lok Sabha elections, Congress leaders in Maharashtra have decided not to flood her with requests to address election rallies before this month’s Assembly elections. The Andhra Pradesh Government today decided to have direct talks with Naxal leaders on October, 15. Earlier, the PWG had proposed direct talks on October 13. Condemning the bomb blasts and militant strikes in Nagaland and Assam, President A.P.J. Abdul Kalam today hoped permanent peace would soon return in these states. The International Labour Organisation (ILO) has complimented India for maintaining high growth in the era of intense globalisation during the past two decades, but commented poorly on its record of economic and social security for the poor. Despite her charismatic personality and PR strategies, Rajasthan Chief Minister Vasundhara Raje would have a tough task mobilising voters in favour of her party candidates in the byelections for two Legislative Assembly seats on October 13. Nearly 72 hours after cancellation of bail by the Supreme Court in the CPI-M MLA Ajit Sarkar murder case and order of his return to the Beur jail, former MP and RJD candidate for the Madhepura Lok Sabha Rajesh Ranjan, alias Pappu Yadav, is still a freebird addressing poll rallies in the constituency today. The National Human Rights Commission (NHRC) has asked the Bihar Government to send within four weeks its comments on the reported sale of a boy by his mother due to hunger and debt. A spectacular display of aerobatics by Russian-acquired SU-30 and nine Surya Kiran aircraft will be the highlight of the 72nd anniversary celebrations of the Indian Air Force on October 8. With barely 10 days to go for the bypoll in the Madhepura Lok Sabha constituency in Bihar, the Election Commission has despatched extra security forces in order to ensure free and fair elections in this sensitive constituency. “I get letters from people who write in blood. Normally very short letters like I love you,” says 38-year old Bollywood superstar Shah Rukh Khan. The government claims that the sufficient stock of certified/quality seed was available to meet the requirement in the ensuing rabi (winter) cropping season. The Indian National Sikh Council presented a memorandum to the Pakistan High Commission condemning the attack on the Nankana Sahib and sought permission to visit the holy shrine to assess the damage. A village in Kerala boasts of 70 pairs of twins. Goa's pulsating nightlife attracts thousands. Today's films ... reflection of a painful reality! Swades all set to hit theatres. Police Commissioner S.K. Sinha said the witnesses were being transported in a police van with necessary protection as per the Supreme Court order. Besides security, the witnesses would be provided free of cost lodging and boarding facilities in Mumbai by the Maharashtra Government, he said here. The Mumbai trial court had fixed tomorrow to start the hearing in the case even as four of the 21 accused were still absconding. Mr Sinha said despite our repeated summons, Citizens for Justice and Peace secretary Teesta Setalvad, who is the legal custodian of Zaheera Shaikh, the prime witness in the case, was not presenting the latter before the Vadodara police to record the statement in connection with the charges levelled by her and her brother Nafitullah against BJP MLA Madhu Srivastava. Moreover, the statements of Nafitullah recently recorded by the Vadodara police in Mumbai and that of Zaheera, were found to be contradictory, he claimed, adding that the Sheikh family appeared to be reluctant to give any further statement to the police. The police chief while ruling out the possibility of the BJP MLA’s arrest, though added that the legislator, his cousin Chandrakant Srivastava and three others, accused of having threatened Zaheera and her family members into turning hostile could obtain bail in the case, if arrested, as it was a bailable offence. Lucknow: The blame game has begun. After making a hash of the much-hyped inauguration of the six-month-long International Taj Festival at Agra Fort on September 27 (World Tourism Day), the state government is now trying to wriggle out of the mess by putting the blame at the Centre’s doorstep. Brushing inconvenient questions like going ahead with the event without clearance from the Supreme Court and the ASI under the carpet, the state government is trying to explain away the complete mismanagement of the inaugural function to the so-called “non-participation” of the central government due to the uneasy state-centre relationship. The fact that the Taj festival was not a top priority for the central government was clear when it had called the meeting to discuss the celebrations matters barely 10 days before the event. The state government’s disappointment can well be understood. It was banking on the mystique of the Taj to boost tourism in the state reeling under the impact of lucrative tourist spots landing in the basket of Uttarakhand. However turning ideas into business opportunities requires more than just wishful thinking. The event packaged to attract foreign tourist visiting the state was reduced to a state-sponsored tamasha catering to the self-styled VVIPs — politicians and bureaucrats. The only foreigners in the audience were perhaps the Ambassadors from Pakistan and Uzbekistan who were invited to the function. According to a senior ASI official present on the spot, there were more policemen present at the venue than guests. The normal tourist was put to inconvenience as the state administration wanted to stop entry at the ASI-protected venue due to the security drill by 2.30 pm itself. However, the ASI did not allow it, as it happened to be World Tourism Day. The police put even the main artists through an insensitive scrutiny frisking. Even internationally renowned artists like santoor player Shiv Kumar Sharma and ghazal singer from neighbouring Pakistan Ustad Ghulam Ali Khan were not spared. Agra people were completely left out of the event. Following the violation of all rules at the Agra Fort, a world heritage site, by the state government the ASI is reconsidering the permission granted to it to hold future programmes at Sikandara and Fatehpur Sikri. If permission is withdrawn the grandiose plans of the state government will fall flat on its face. The Supreme Court’s disallowing night viewing of the Taj has already deprived the event much of its charm. Despite a decision taken by the Chief Minister at a meeting on January 7, 2004, to celebrate the International Taj festival and a Cabinet decision on June 22 to start preparations for the same nothing had been finalised barely three weeks before the event. At the press conference called by the state Tourism Minister on September 3, it had become clear that requisite permission from the ASI and the Supreme Court was not in hand. The artists had not been finalised. As a matter of fact, the budget for the programme was finally sanctioned as late as on September 14 less than a fortnight before the inauguration. The cash-starved state government decided to invest Rs 5 crore in the festival in the hope of reaping rich dividends. Of this, Rs 2.5 crore is earmarked for converting the Mahatma Gandhi marg in Agra into a no headlight zone while the remaining Rs 2.5 crore is for a power-packed publicity campaign to attract tourists. According to a tour operator, foreign tourists usually decide their itinerary well in advance. With the tourist season almost in, the methodical foreign tourist may have already planned for the season ahead. So even a high-powered publicity campaign at this stage may not help. At the end, after sinking in Rs 5 crore of hard-earned tax-payers, money, the festival may become another tokenism to the famous Taj — with only a mismanaged cultural event and perhaps a postage stamp to remember it by. The NRIs have set up an organisation called ‘’My Orissa’’ and have appealed to the people of Orissa to donate funds for the widow and other family members of Raghu Nayak, who were struggling to make both ends meet. Raghu used to work as a gardener at Birla House, the erstwhile residence of Mahatma Gandhi. His duty was to serve goat milk to Bapuji everyday in the morning, said a family member. A staunch follower of Mahatma Gandhi, Raghu, a resident of Orissa’s Kendrapada district, was devoted to the Mahatma and cherished his ideals. The then President of India, Dr Rajendra Prasad, had granted a sum of Rs 500 along with a letter of recognition to Raghu Nayak for showing exemplary courage immediately after Gandhiji’s assassination. Raghu Nayak died on August 13, 1983, at the age of 72 in his village in abject poverty. His family members are now struggling with his meagre pension of Rs 25. Two years ago his son Bidyadhar Nayak, who was a driver with the state police, died in an accident. The sources said an NRI recently donated $ 240 through the organisation, ‘’My Orissa’’ for Raghu’s family members and also urged other NRIs from the state to donate generously. Mr Roh will hold wide-ranging discussions with Prime Minister Manmohan Singh on the gamut of bilateral, regional and global issues of mutual interest. Mr Roh, who will be accompanied by a high-level official delegation including ministers of foreign affairs and trade, commerce, industry and energy, and information and communication, will meet President A.P.J. Abdul Kalam and hold talks with Prime Minister Manmohan Singh, Vice-President Bhairon Singh Shekhawat and External Affairs Minister K Natwar Singh. Two police jeeps were destroyed in the attack, the police said. Several policemen, including the Additional Superintendent of Police, were injured in the stone-throwing incident. According to the police, the deceased, Shamim Khan, was beaten up by the local residents after being caught in a theft on Friday night before he was handed over to the police. The man was admitted to MGM Hospital as he complained of some problems and he was discharged soon after the treatment. But after taking back to the police custody he started vomiting and was again brought back to the hospital, where he succumbed to his injuries, the police said. But the residents alleged that the man died in the police custody. The situation was, however, brought under control following the intervention of east Singhbhum Deputy Commissioner Sunil Kumar Barnawal, who announced Rs 10,000 compensation and allotted a shop to the family of the deceased. The minister after laying the foundation stone of six-road-over railway bridge here said policemen would be asked to keep an eye on persons throwing waste and defecating on the railway tracks and a penalty would be imposed on them. “No compromise would be made on security and cleanliness in the Railways,” Mr Yadav said. He also warned the ticketless travellers and said frequent checks would be done to catch free trippers. The minister said the Railways was trying to enhance its revenue without increasing passenger fare and freight charges. He said the days of the mafia who try to corner railway contractors were over and such elements would be dealt with severely. The minister said arrangements would be made for those being displaced or bearing loss because of the construction of road-over-railway bridge. The recent spell of floods in North Bihar have caused large-scale damage to the Railways and repair work is being carried out on war footing, he said adding, the Railways also plans to raise the height of tracks and expand the width of bridges as precautionary measures. Meanwhile, in Bihta, Bihar Mr Yadav today warned against the growing trend among a section of commuters to pull alarm chain in trains at unscheduled places. Such illegal acts indulged by a handful of passengers affected adversely the punctuality of the train causing inconvenience to people, he said. Mr Yadav also noted that overcrowding of reserved coaches by wayside commuters made the journeys of genuine persons authorised to travel in such bogies uncomfortable. Reaffirming the resolve of the Railways to eliminate role of muscle power in the process of awarding contracts, he pointed out that LJP leader and MP Surajbhan Singh was blacklisted by the Railways in respect of bidding for railway contracts to ensure fairness. Addressing functions at Rajendra Nagar terminal and Bihta station in connection with laying foundations for altogether seven-road-overbridges, the Railway Minister warned against breach of discipline during train journeys and said that appropriate penal measures would be taken against such erring personnel. Flagging off the inaugural run of a toy train at Sanjay Gandhi Biological Park here last evening, he said the issuance of a notice to him in the fodder scam probe by the Supreme Court had provided him an opportunity to put facts before the apex court. Rahul Gandhi is being wooed avidly even though Congress President Sonia Gandhi will address 12 election rallies in the run-up to the October 13 polling day. “We have sent him several requests and are still awaiting a reply from Rahul,” a Congress leader said. According to party sources, state leaders keen on keeping all their options did send a few requests to Priyanka Vadra to address election rallies. However, considering her refusal to campaign in Maharashtra in the past, they have drifted away in search of star campaigners. Meanwhile, Sonia Gandhi kicks off her election tour in Maharashtra next week with 12 rallies. According to party sources here, she would address some of the meetings individually while sharing the dais with NCP chief Sharad Pawar at others. According to Maharashtra Pradesh Congress Committee chief Prabha Rau, Ms Sonia Gandhi’s itinerary is being finalised in consultation with party leaders across the state. The government has decided to hold talks with Naxalite leaders on October 15 in view of the byelection to the Asifnagar Assembly constituency on October 13, Home Minister K. Jana Reddy told mediapersons here after meeting Chief Minister Y.S.R. Rajasekhar Reddy. In separate condolence messages to Assam Chief Minister Tarun Gogoi and Nagaland CM Neiphiu Rio, Mr Kalam said he was distressed to learn about the series of bomb blasts and militant attacks which took place in their respective states yesterday resulting in loss of human life. “I fervently hope that permanent peace will return to the states soon. I am sure that the state governments have made all arrangements to treat the injured and provide succour to families of those who have lost their loved ones,” he said. “Although the great majority of countries had lower growth in 1980 and 2000 than in 1960-80, China and India are notable exceptions,” the ILO says in its just released report ‘Economic Security for a Better World’. Statistics provided in the report shows that there has been a downward trend in the rate of economic growth of developing countries after 1980 and an increase in the volatility of growth. The average annual growth rate of world output declined from 4.6 per cent to 2.8 per cent in these two periods. In the first, world output grew 2.5-fold in the second only 1.7-fold. For G-7 countries, the slowdown was marked from 5.1 per cent to 2.4 per cent a year. Even in the United States — in spite of the prosperity of Clinton years — the average growth rate in the second period (3.2 per cent) was below that of the first (3.5 per cent). Despite her charismatic personality and PR strategies, Rajasthan Chief Minister Vasundhara Raje would have a tough task mobilising voters in favour of her party candidates in the byelections for two Legislative Assembly seats on October 13. The Behror and Merta Assembly seats in Alwar and Nagaur districts, respectively, were vacated when the sitting legislators were elected to the Lok Sabha. There are eight candidates in Behror and five in Merta. But as the electoral main contest would be between the BJP and the Congress. The BJP candidate for Behror is Mahant Chandnath while the Congress has fielded Mr Basti Ram Yadav, a close relative of Dr Karan Singh, a Congress MP. The BJP and Congress candidates for Merta are Mr Rampratap Baggar and Mr Ramchandra Arora, respectively. Mr. Baggar’s father, Mr Ram Lal, has been a Congress MLA for two terms. The candidature of Mahant Chandnath for Behror, which is apparently the choice of Ms Raje, has annoyed party workers, especially former MP, Jaswant Yadav, who as a rebel is contesting against the official candidate. The state BJP chief, Mr Lalit Kishore Chaturvedi, in stern disciplinary action has expelled Mr Yadav from the party. The opposition to Mahant Chandnath has cropped up for three strong reasons. Firstly, he hails from Haryana and is, therefore, being treated as an outsider. Secondly, he is a defeated BJP soldier in the last Lok Sabha battle of the ballot and thirdly, he has a tainted image because of his alleged involvement in certain criminal cases. The electorate of Behror is dominated mainly by the Yadavs and the Rajputs. Since this time the Rajput lobby also tried hard to get the ticket for a member of the community, it is unhappy over the selection. A meeting of the Rajput community leaders held recently at Nimrana to express anguish over the choice created a stir in BJP circles. Ms Raje is, therefore, going to launch the election campaign from a Rajput-dominated village to woo the voter. To counteract it, the Congress is keen to bring Mr Jyotiraditya Scindia, nephew of the Chief Minister, to win over the Rajputs while Union Railway Minister Laloo Yadav is being invited to influence the Yadav community. The presence of Mr. Jyotiraditya Scindia in the Congress election campaign will certainly pose a big challenge to his aunt, Ms Raje, in the poll arena. In the Merta constituency, it is for the first time that Congress leaders of the area — Mr Harendhra Mirdha, Mr Richhapal Mirdha, Mr Ram Raghunath Chaudhary and Mr Harji Ram Burdak — are unitedly working to ensure the victory of the official candidate. Viewed in totality, Behror and Merta byelections are likely to put Chief Minister Raje’s popularity to an acid test. Yadav yesterday ran from pillar to post to surrender after the apex court cancelled his bail, but neither the police nor the Sub-Divisional Judicial Magistrate accepted his surrender. Yadav is likely to surrender before special CBI court here tomorrow, sources close to the RJD leader said. “As a law-abiding citizen, Yadav attempted to surrender at Madhepura, but neither the police nor the SDJM accepted his plea on technical grounds, now, he will surrender before the Special CBI court in the state capital tomorrow,” they said. 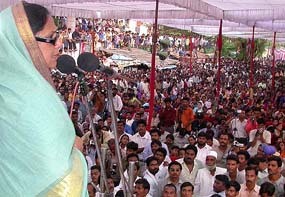 Yadav addressed a series of rallies today in different parts of Madhepura, seeking support for himself. Yadav, who recently left the Lok Janshakti Party of Union Minister Ram Bilas Paswan to join the RJD headed by Railway Minister Laloo Prasad Yadav is pitted against Mr R.P. Yadav of the JD (U) in the bypoll scheduled for October 13. Taking cognisance of news reports regarding sale of a boy by his mother, NHRC Chairperson Justice A.S. Anand has directed that a copy of the news report be sent to the Chief Secretary of Bihar and the District Magistrate, Vaishali, for comments. According to the report, Dharani, who lost her two-year-old boy, took this step in order to save the lives of the members of her family. She left home with her two-month-old son and returned after selling the child for Rs 6,000.Dharani reportedly wanted her family to be free of a debt of Rs 5,000. The report also quoted her husband, Lal Babu Paswan, a TB patient, as saying that he beat his wife and neighbours thrashed her. The report further alleged that the government dispensary had declined to get his medical investigation done free of cost for suspected TB relapse. The report said Paswan was neither a recipient of the Red Card nor a beneficiary under the Anapurna scheme. Due to the rehearsals, the airspace over the National Capital would also remain closed for two hours from tomorrow till October 8. The residents have also been warned that fighters would be flying at heights varying between 60 to 150 m above ground over Manesar-Gurgaon-Delhi Cantt and Tilpat-Qutab Minar-Shankar Vihar-Palam area and also Dwarka. He said the other aircraft taking part in the fly-past would be the IAF’s latest acquisition IL-78 mid-air refueller, MI-35 Helicopter gunships as well as indigenous Advanced Light Helicopter Dhruv. “The fighter aircraft would be flying at heights varying from 60 to 150 m above the ground with the fighter flypast, being ushered in by five Jaguars which took part recently in the multi-nation exercises in Alaska in United States,” he said. The Jaguars would be followed by arrowhead formations of Bisons, Mig-23, Mig 29 and Mirage 2000, which would be tailed by the IL-78 mid-air refueller with two Jaguars fighters plugged in. The air show would be climaxed by a Su-30 carrying out a vertical charlie over the technical area, while two Mig-29 air-superiority fighters escorting it would peel outwards. With barely 10 days to go for the bypoll in the Madhepura Lok Sabha constituency in Bihar, the Election Commission has despatched extra security forces in order to ensure free and fair elections in this sensitive constituency. “The commission has sent additional forces for Madhepura,” EC sources said without elaborating. The commission had earlier decided to deploy central government officials as presiding officers in the constituency which goes to the polls on October 13. There are as many as 1,100 polling stations in the high profile constituency. Six observers, would monitor the polls in the constituency vacated by RJD Chief and Railway Minister Laloo Prasad after he decided to retain the Chhapra seat. The RJD candidate, Mr Rajesh Ranjan, alias Pappu Yadav, is contesting the bypoll. The sources said the commission has also appointed an additional observer for the bypoll for the Mainpuri Lok Sabha seat in Uttar Pradesh. “No one holds a candle to him,” says director and friend Karan Johar, who insists on casting Khan as lead in all his films. “Forget the top 10. He is one-to-fifty by himself,” Johar said. As against the projected requirement of 60.85 lakh quintal, 76.38 lakh quintal certified/quality seed was available with various seed producers and stores, according to an official release today. States had been requested to prepare district-wise ‘seed maps’ to plan for the seed production and distribution on a long-term basis. For the coming rabi season, states were asked to focus on the seed production of crops that might be affected due to deficient or heavy rains or pests so that sufficient seed was available for the next season. The Agriculture Ministry had already alerted the states about assessing the requirement of quality seed and taking steps for its availability. It was brought to their notice that the demand for quality/certified seed was likely to be higher this year as heavy floods in the eastern and north-eastern parts of the country during June-August had damaged farm-saved seeds of wheat, gram, mustard and some other crops. For cereals a total of 63.23 lakh quintal seeds are available as against the requirement of 48.78 lakh quintals, for pulses 5.01 lakh quintals against the requirement of 4.71 lakh tonnes, for oilseeds 4.05 lakh quintals, against the requirement of 3.31 lakh quintals, for cotton and potato crops the seeds are available as per the demand. The attack, the memorandum said has “hurt the sentiments of Sikhs not only in India but the whole world. Besides, such incidents can have wider ramifications and create misunderstanding between two nations.” Mr Kuldip Singh Bhogal, president of INSC, in the memorandum said that proper steps and measures be taken to avoid such incidents from recurring.